Just the concept of wood gates, just thinking of them, can bring about a sense of calm. We imagine a pristine English garden or a bucolic field, a stone patio at sunset or a wandering tree-lined drive... You get the idea. There's tons of inspiration to be found for cool wood gate designs you could try out in your own garden or backyard. From white painted picket fences to rustic natural wood and gates seeming to appear like magic from overgrown hedges... We've rounded up 10 swoon-worthy gates to inspire all your wildest landscaping dreams. Pretty as a painting, isn't it? There's something so soothing about a traditional white picket fence, especially one surrounded by rose bushes and vines allowed to grow wild. This gate is surrounded by lush greenery and is doubly appealing thanks to the trellises overhead that will eventually be covered with flowers and vines. This criss-cross gate is almost hauntingly beautiful, isn't it? The spidery trees that line the dirt road add a storybook look to this property, and we can only imagine that it must look cheerful and inviting during the spring and summer months. We love that this gate doesn't obscure any of the bucolic scenery, and truly feels rustic and hand-crafted. This modern and stunning wood gate by Jeffrey Gordon Smith is more of a door, but we're not ones to split hairs. We love the contrast of the heavy wood and the rough stones—it creates a beautiful passageway leading in and out of an idyllic outdoor setting. The blogger behind Coco Cozy snapped this photo of a hidden garden gate at the Parker Hotel in Palm Springs. We love how it seems to have appeared out of nowhere in this overgrown and extremely high hedge. The Parker is a popular hotel in the Palm Springs area because of design details like this that make you feel like you're a world away from the hustle and bustle. We love seeing how design influences from around the world can be translated and intermingled with other types of architecture and of course, local flora and individual gardening tastes. This wood gate with a pergola reminds us of some of the ancient and historic architecture of China and Japan, which inspire a calming, zen vibe in your outdoor space. ​Certainly not subtle, these oversized wood gates serve as much as a piece of art as they do a divider or entrance. We love the bold, statement-making size and grandeur of these gate pieces. Just keep in mind that you need to have a large enough property (like a farm) to properly support such an eye-catching architectural element. There's a lot to love about the traditional architecture of the Greek islands, from the striking contrast of white stucco walls, bright blue doors and blooming pink bougainvillea. Perhaps more subtle but still important are the waist-high gates that line the cobblestones streets—sectioning off stairways and homes and hotels, but not daring to obscure the miraculous views of the Aegean Sea and further islands in the distance. We love to see these low gates and fences in places where you still want to be able to see the scenery or neighborhood around your home and property. 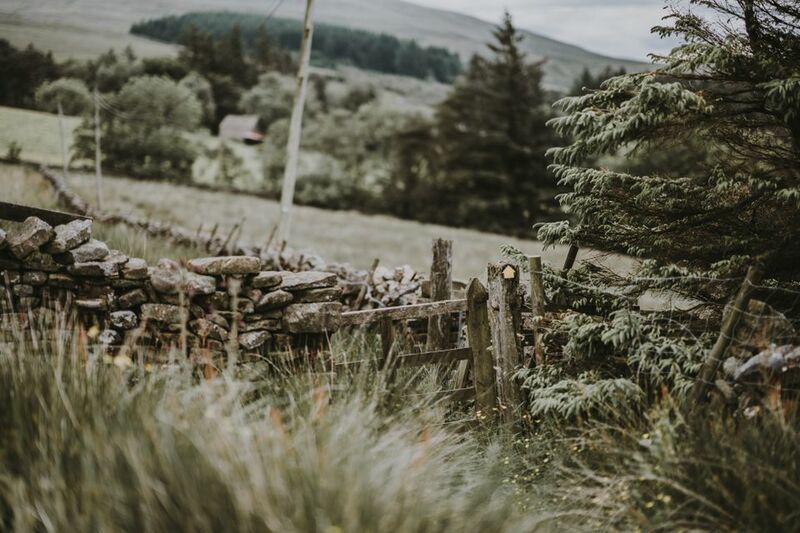 Few things are more pastoral and picture-perfect than a well-worn wooden gate flanked by wild trees and rolling fields and hills. If you're lucky enough to live on an expansive amount of property or a farm, you might have one of these gates dividing fields and crops, or the wild land from your maintained lawn and gardens. We like how big gates like this are as practical as they are visually appealing. It almost feels like you could begin writing a fairytale with a description of this gate. We love how rustic and worn it is, and how the surrounding scenery is wild and mysterious. This wood gate is surrounded by a stone fence that looks like it could have been there for 100 years, only adding to its charm and appeal. Wooden gates nestled in large, looming hedges always make us think of The Secret Garden. A gate like this can't help but inspire wonder and curiosity from anyone who passes by. This is a design element that makes a garden or outdoor space feel truly magical and special, no matter what lies on the other side.